Last time we learned that the amount of useful work, W, that a steam turbine performs is calculated by taking the difference between the enthalpy of the steam entering and then leaving the turbine. And in an earlier blog we learned that a vacuum is created in the condenser when condensate is formed. This vacuum acts to lower the pressure of turbine exhaust, and in so doing also lowers the enthalpy of the exhaust steam. Putting these facts together we are able to generate data which demonstrates how the condenser increases the amount of work produced by the turbine. To better gauge the effects of a condenser, let’s look at the differences between its being present and not present. Let’s first take a look at how much work is produced by a steam turbine without a condenser. where BTU stands for British Thermal Units, a unit of measurement used to quantify the energy contained within steam or water, in our case the water to steam cycle inside a power plant. Technically speaking, a BTU is the amount of heat energy required to raise the temperature of one pound of water by one degree Fahrenheit. The term lb should be a familiar one, it’s the standard abbreviation used for pound, so enthalpy is the measurement of the amount of energy per pound of steam flowing through, in this case, the turbine. 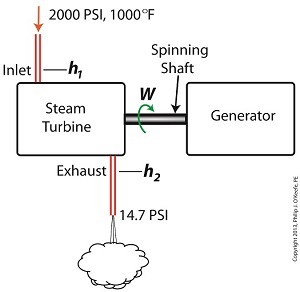 This equation tells us that for every pound of steam flowing through it, the turbine converts 459 BTUs of the steam’s heat energy into mechanical energy to run the electrical generator. Next week we’ll connect a condenser to the steam turbine to see how its efficiency can be improved. Last week we identified some inefficiencies in our water to steam power plant energy cycle. The superheater addressed some of these concerns, but not others. Our illustration discloses one of these wasteful areas to be coming from the turbine exhaust. That’s energy laden steam being expelled into the surrounding atmosphere! It’s the same heat energy that was produced in the boiler when water was transformed into steam. It came from burning fuels like coal, natural gas, and oil, all expensive and precious natural resources. 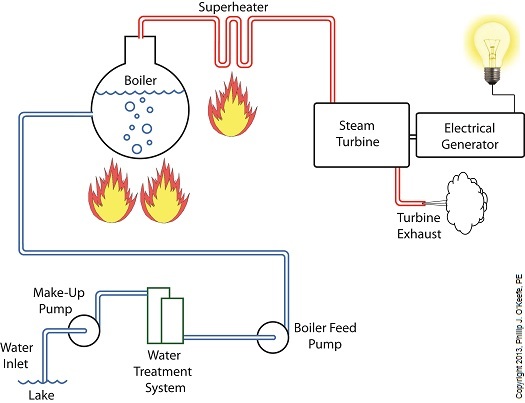 In its present configuration the power plant will work, but because steam is being continually dispersed into the atmosphere, it must continually be replenished. The key ingredient, water, must be drawn into the power plant from a nearby source, treated for contaminants, then fed into the boiler to make up for lost steam. That wastes both water and energy, because the make-up pump, which draws water from the lake for treatment, (thus “making up” for spent water), is continuously operating, resulting in excessive wear and tear and increased operating costs. Fortunately, power plant engineers have devised methods to correct these inefficiencies. They’ve come up with a clever means of recapturing exhaust steam, thus enabling it to recycle within the system. Next week we’ll see how this is accomplished with a piece of equipment called a condenser. Imagine being a typical guy, the kind that hates to shave and would never dream of wearing anything that even remotely resembles makeup. That was me, before being contacted by The Discovery Channel to act as a subject matter expert on the topic of steam power plants and electrocutions, part of a series they’ll be airing in the near future to be called Curious and Unusual Deaths. Little did I know when agreeing to appear on the program that I was also agreeing to venture into an area of human experience most males would like left to the females, that of donning facial makeup. Upon my arrival in Toronto to meet up with the producers I was treated like a celebrity. A chauffer had been sent to greet me at the airport, and I was driven to a fancy downtown hotel. 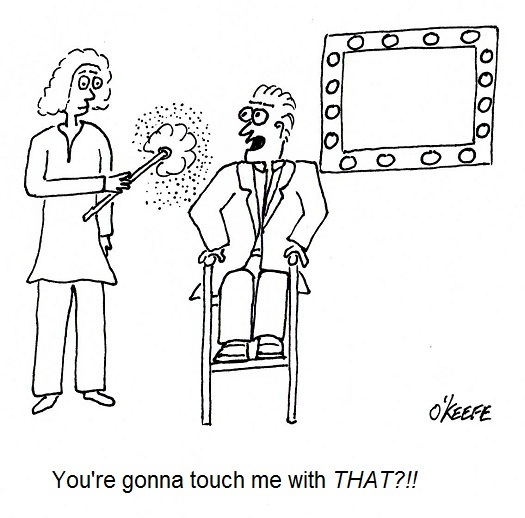 The next morning I was driven to the video studio and spent some time in the makeup chair to get gussied up. My imperfections muffled, I was invited to take a seat in front of a green screen, and for those of you who don’t know what the function of this marvel of photography is, let me briefly explain. The green screen enables the editors to digitally impose any kind of background behind me at a later time of their choosing, anything from the Grand Canyon to footage of World War II. As of this time I have no idea what images will be shown in back of me as I speak. It’ll be interesting to see where I end up! Once the cameras and lights were adjusted in the studio, there was a clack from the director’s clapper board, accompanied by a shout of “roll ‘em!” And we were off shooting, just like in Hollywood. Two video cameras shot me simultaneously, one placed directly in front and one to my left. One of the show’s producers sat next to the front-positioned video camera during shooting. She needed to be within earshot, because she soon proceeded to ask me pointed questions about the science behind each incident being investigated. It was up to me to ad-lib the responses, bearing in mind that the subject matter was technical and had to be conveyed to an audience of average technical background in a manner in which they could understand it. Every now and then we’d take a break from filming so the crew could tend to the video equipment. It seems that adjustments had to be continually made to both cameras and lighting. Videotapes had to be changed, and the makeup artist would use these as opportunities to tweak my makeup. All in all it was an enjoyable experience. Everyone acted professionally and was easy to work with, and the producers expressed their satisfaction with the part I had played. I was told that I explained the technical subject matter in a way that anyone could understand, and I thanked them. But after all, as I shared with them, that’s my job! It was nice to hear that I was doing it well. Next time we’ll get into how GFCI outlets help to prevent you from getting electrocuted and from becoming a potential subject on Curious and Unusual Deaths.